The United States should break Israel’s blockade of Gaza and deliver badly needed supplies by sea, a U.S. congressman told Gaza students. 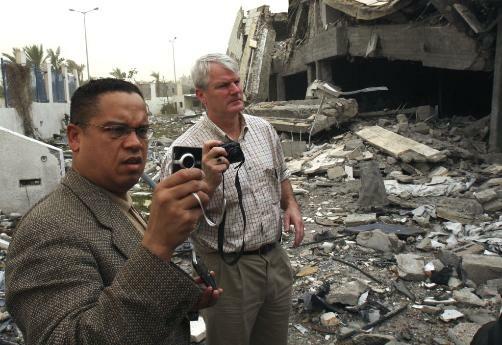 Rep. Brian Baird, a Democrat from Washington state, also urged President Barack Obama’s Mideast envoy to visit the Hamas-ruled territory to get a firsthand look at the destruction caused by Israeli’s military offensive last year. (Rocketing) from Gaza doesn’t necessarily mean that any response, regardless of scope, target or impact on civilians, is necessarily justified, moral or strategically prudent. This kind of misleading duality itself reflects the thinking, on both sides, that can make peace so hard to achieve and violence so easy to justify. The fact is, there were and are many alternative responses possible and it is a false dichotomy to suggest, as some have, that if one criticizes the actions taken by Israel in Gaza and the West Bank then one is necessarily ignoring the rocket attacks from Gaza or somehow siding with or enabling terrorists. In my judgment what has happened in Gaza and what goes on in the West Bank every day endangers U.S. integrity and security and ultimately strengthens hard line extremists at the expense of moderates and to the detriment of long term Israeli security. I also believe, having traveled and met with people throughout the region, that this adverse effect is not confined to Palestine but extends to varying degrees throughout the Islamic world and beyond. I understand that people may disagree strongly with this perspective, but I am certainly not alone in expressing it. Many people have contacted my office to convey support for what we have said about our visit and this includes many friends of Israel within our own country. Click here to thank Rep. Baird for his courage. This entry was posted in Gaza, Human Rights, Israel, Palestine, Peace, Politics, War on February 16, 2010 by Rabbi Brant Rosen. As my representative in congress, please personally thank Rep. Brian Baird for his courage for calling for the end of the Gaza blockade. Sadly, many representatives don’t seem to have his courage on this issue. What do you think could be done to change that? Despite his claims, siding against Israel’s attempts to survive while surrounded by enemies is nothing more than than siding with and enabling the Muslim terrorists in Gaza and the rest of the Muslim world. It shows them that, if they keep using terrorism and keep hiding behind their civilian populations, they will eventually win. Yes, Israel has a lot of blood on its hands as well; there’s no point in denying that. It’s just that, if one has to choose between the two sides, Israel is the one worth saving. All Baird was doing was showing his own cowardice. He’s terrified of the backlash that the US might receive from helping Israel survive and is willing to sacrifice them for his own security. In my judgment what has happened in Gaza and what goes on in the West Bank every day endangers U.S. integrity and security and ultimately strengthens hard line extremists at the expense of moderates and to the detriment of long term Israeli security. I reject your analysis that this is a “zero-sum” conflict in which we have to decide “which side is worth saving.” This is about providing the political will to convince both sides that negotiations, not war, is the only thing that will bring about mutual safety and security. Cowardice? Frankly, if there are any terrified politicians on Capitol Hill, it is those who stay awake nights fearing that they will get on AIPAC’s “enemies of Israel” list for disagreeing with Israeli policy. Sad to say, there are precious few who have political guts like Baird.